What is a brow lift? A brow lift, also referred to as a “forehead lift” or “eyebrow lift,” reduces expression lines and wrinkles as well as other signs of aging in the forehead and brow region. A traditional brow lift procedure can be performed for dramatic results by lifting the skin and muscles of the brow to a higher position; a minimally invasive or endoscopic brow lift can provide more subtle results by making minor adjustments to the underlying tissue. Whatever your goals with brow lift surgery, Dr. Samson can perform a natural-looking brow lift that will reduce the signs of aging and give you a more refreshed facial appearance. Ideal forehead lift candidates in the Daytona Beach area are physically healthy, do not smoke, and have specific yet realistic expectations for the procedure. Before a consultation with Dr. Samson, view some of their brow lift before and after photos to get an idea of what to expect. Either intravenous sedation or general anesthesia will be administered to make you more comfortable during forehead lift surgery. 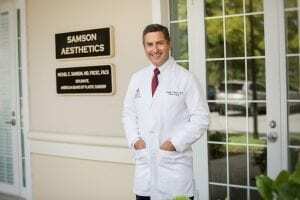 Dr. Samson offer many surgical techniques that can be customized to achieve your desired result. Traditional brow lift: Also known as a “coronal brow lift,” traditional brow lift surgery is most suitable for those with deep wrinkles across the forehead and extreme sagging in the brow area. The incision is made within the hairline from ear to ear, which allows the surgeon full access to the underlying facial muscles and tissue to correct wrinkles. Once the tissue is adjusted, the skin is then redraped over the new facial structure, and any excess skin is removed. This technique requires a longer recovery time due to the length of the incision. Endoscopic brow lift: This technique is performed using an endoscope, a surgical video device that allows the surgeon to view the surgery through very small incisions made within the hairline. Tissues and muscle can be repositioned or removed to correct the source of forehead wrinkles. Temporal brow lift: A temporal brow lift, also known as a lateral brow lift, is another minimally invasive procedure that lifts the outer third of the eyebrows only. It can smooth small wrinkles in the forehead and remove the wrinkles around the eyes known as “crow’s feet.” Tiny incisions are made in the hairline near the temples, and sometimes an endoscope is used to move the tissue and skin. Mini brow lift: A mini brow lift is ideal for minor wrinkles and drooping brows. A one and a half inch incision is made behind the frontal hairline or at the hairline for those with high foreheads or receding hairlines. Tissues and underlying muscles are then adjusted. The brow lift procedure will take 45 to 90 minutes to perform depending on the technique used. Once incisions are made, the tissue and muscles are adjusted and any excess skin is removed. All incisions with forehead lift surgery are closed with sutures or skin adhesives and are easily hidden within the hairline. After surgery, your head may be wrapped to reduce swelling and bruising. You will receive special instructions regarding care for your bandages and surgical drains, and your doctor will prescribe some pain medication. Brow lift recovery time depends on the type of brow lift procedure you choose. Many patients look and feel well enough to go out in public one to three weeks after surgery. The cost of a brow lift varies depending on the type of procedure you choose. Other costs include costs related to the surgical facility, anesthesia, medical tests, prescriptions, surgical garments, or other miscellaneous costs. Dr. Samson can give you an accurate forehead lift cost estimate during a consultation at their practice in Florida. Many patients opt to achieve a more complete aesthetic appearance by getting a facelift or eyelid surgery in conjunction with a brow lift. Multiple procedures performed at the same time will often be less expensive than getting them done separately. If you are interested in these or other cosmetic surgery procedures in the Daytona Beach, FL area, schedule a consultation by calling 386-756-9400 or fill out our contact form.